While e-books have entered some classrooms, STEM instruction has remained unchanged for nearly as long as the subjects have been taught. With his interactive app, Weinberg, a PhD candidate at Carnegie Mellon University, hopes to inspire a new kind of classroom engagement. 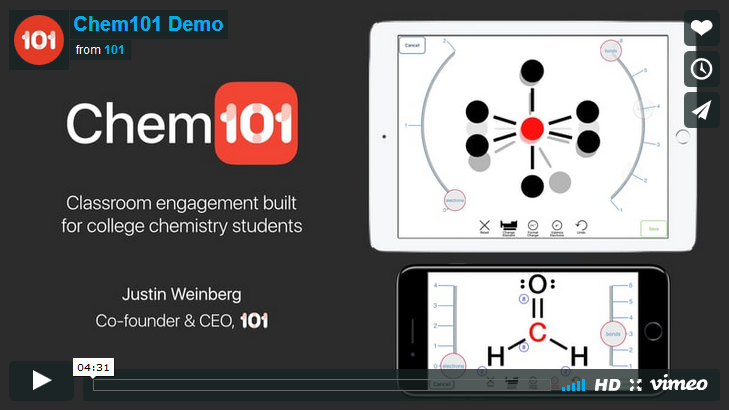 Chem101, his first subject-specific tool, allows students to interact with and respond to an instructor in real time, and receive automated feedback to use in later classroom discussions. Take a topic that vexes a lot of first-year chemistry students: Lewis structures. Lewis structures, also known as Lewis dot diagrams, are two-dimensional drawings that show how molecules in an element are connected, as well as the shape of the molecule. During a lecture, students can use 101 to practice drawing these structures, which educators can then view, review and correct if needed. After a pilot study last fall, the app is being used at several major U.S. universities with much favorable feedback.